Picture perfect Constellation lamps from Nova68. We love these stylish lamps; they effortlessly blend rustic charm with a touch of bohemian modern elegance, making them equally suitable for both high end contemporary modern homes and classic turn of the century Brooklyn brownstones. Would love to have these light fixtures above the kitchen counter or above the dining table. These would also look beautiful hung in groups, suspended at different heights in a corner of a room. The beautiful Constellation pendant light fixtures were inspired by the stars that light up the sky on a crisp and clear night. Natural-looking globes are crafted by hand of zinc-plated iron and are hand-drilled to create these wonderful stellar pendant shades. Stardust sparkles of light shine through and create a captivating light display. Pendant lights feature clear electrical cords and quality porcelain sockets. These attractive Constellation pendant lamps set the perfect tone with a truly timeless look. 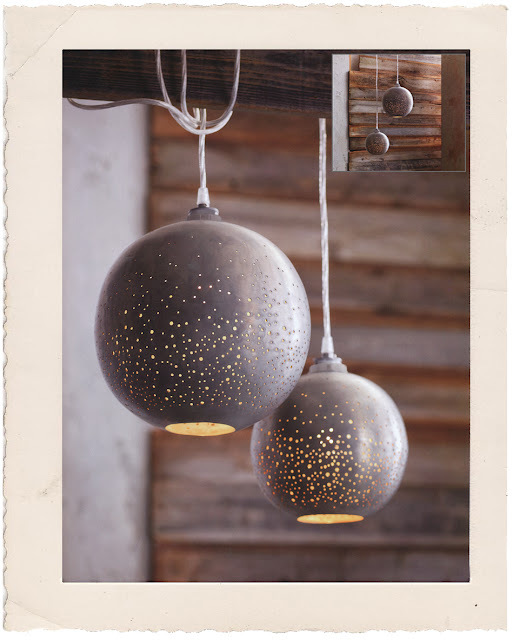 The brilliant Constellation pendant lights create a welcoming and warm ambience in any room. Made with UL listed components. Small lamp 40 watt max; large lamp 60 watt max.